To Map or Not To Map – There is a Checkbox! At my office we’ve begun making several changes to how we manage the desktops and applications for our users and we are taking advantage of Group Policy preferences. We aren’t ready to deploy Windows 7 quite yet, but Windows XP machines can take advantage of Group Policy preferences with the addition of the client side extensions. The preference we opted to start with was mapping drive letters, which was done with several log on scripts in the past. Everything seemed to be working just fine until a user who accessed the system remotely through our Terminal Services RemoteApp reported that one of the drive letters was missing. Turns out that particular drive mapping was misbehaving for several people on various computers. I compared the troublesome mapping to one that was working correctly and found the only difference was a single check box for “Reconnect”. The “update” action setting is supposed to create the mapping if it doesn’t exist, however that doesn’t seem to be working quite a expected. 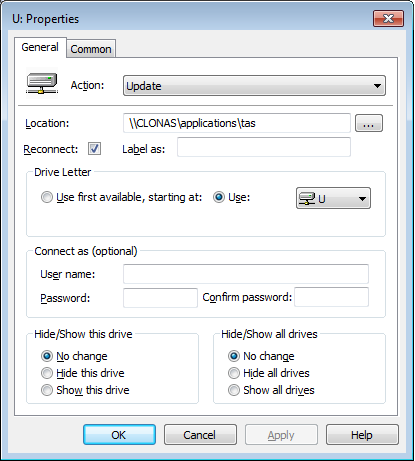 The reconnect check box saves the mapping in the user’s settings and attempts to restore it at each subsequent log on. I didn’t experiment further, but perhaps if I used the “replace” action setting for the mapping I wouldn’t have the issue at all, as that deletes and recreates the mapping every time. Either way, the reconnect check box saved the day.